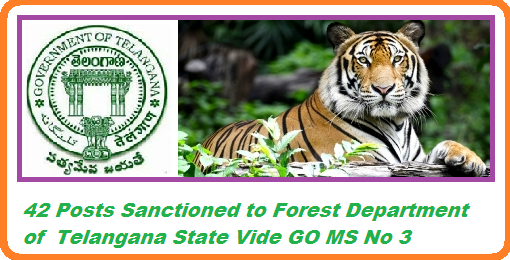 GO MS No 3 Sanction of 42 posts to Forest Department of Telangana State Environment, Forest, Science & Technology Department– Creation of (42) Supernumerary posts in Telangana Forest Department–Orders - Issued. In the GO 1stread above, Government issued instructions to transfer and adjust Telangana employees working in the (7) Mandals of Khammam District transferred to Andhra Pradesh. Accordingly, the Principal Chief Conservator of Forests, Telangana State, Hyderabad after taking options from the affected personnel, submitted report to the District Collector, Khammam. In the circumstances explained by the Principal Chief Conservator ofForests, Telangana State, Hyderabad in the reference 2nd read above,EFS&T Department has requested for creation of (42) Supernumeraryposts in various divisions of Khammam District. Government, after careful examination of the proposal, hereby accord sanction for creation of the following supernumerary posts to accommodate the employees from the (7) Mandals transferred to Andhra Pradesh, who opted for Telangana State with effect from the date of joining of the individuals. The sanction for the above supernumerary posts shall lapse as and when a regular vacancy arises in the relevant categories or till the person vacates the post, whichever is earlier.